Waste Problems | AC Waste Services Inc.
How much money could your company save by switching to a compactor? An unsightly mess, created by spilled or leaking garbage, that reflects negatively on your company’s image. Too much haulage service & associated cost. Outsiders dumping their trash into your container thereby creating additional haulage expense. Excessive labor required to load containers & cleanup mess. Floor, aisle & dock space used to accommodate trash because containers are full, unavailable or not large enough for bulky items. Odours permeating from the open container or from liquids that have been spilled onto & absorbed into the ground. Employees who use the garbage containers to hide, then later steal, products from your business. Fire, vandalism or injury from outsiders rummaging through your waste in search of valuables – acts that can increase your insurance premiums. Truck congestion and/or pavement damage in your receiving or shipping areas. Unsafe conditions, relative to the lifting, loading or packing of waste or to spilled glass, nails & other refuse that could result in injury & expensive compensation claims. “Weather waste” – substantial increases in dumping charges caused by the weight associated with rain and snow. 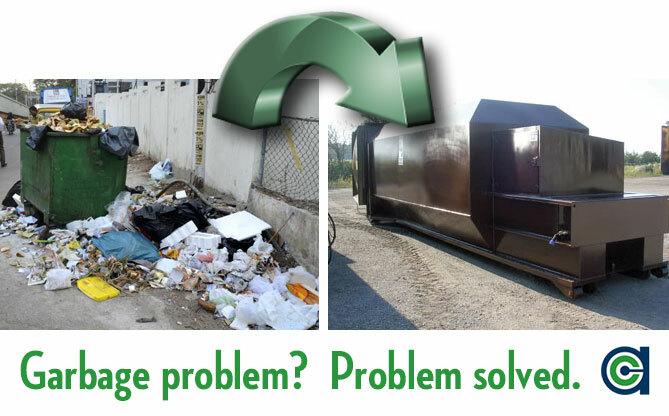 Need more reasons why rent a compactor makes sense?